PayPal is a well established e-commerce company through which our church is able to accept online donations, tithes, and offerings. We are able to do this through fees that PayPal charges on each transaction. When you donate, PayPal will receive 2.2% of your amount, plus $0.30. For example, if you donated $100 with a credit card, the church will receive $97.50 and PayPal would receive $2.50 in fees. No. You may donate online with your credit card by following the directions below. This will take you to a PayPal website. Enter the amount that you would like to donate at the top of the screen. If you have a PayPal account, you can login at the bottom right of the screen. Make sure you fill in all your information. The church needs your address so you can receive a charitable contributions statement at the end of the year. Any undesignated donation will be directed to tithes/offerings. 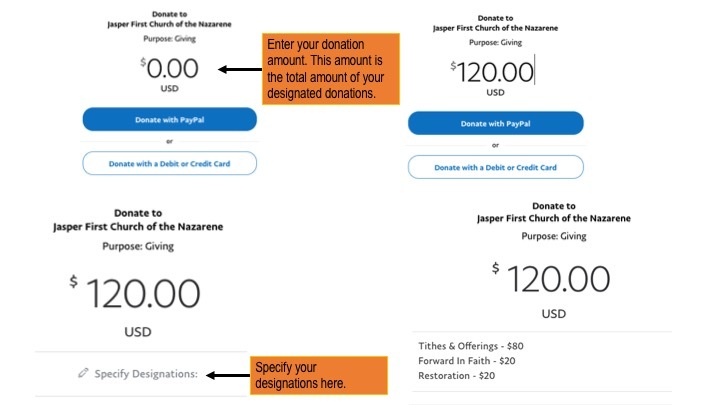 If you would like to designate your donation to a specific ministry, or divide your donation between multiple ministries, you may do so in the designation line.